– Structural Integration bodywork is a hands-on approach to creating balance and awareness in one’s body. It is process-oriented work that releases tensional patterns in the structure allowing the opportunity for more efficient movement and most importantly the awareness of that free movement. Dr. Rolf felt that as a species, we had evolved as much as we could unconsciously. She felt that in order to grow more, we needed to participate in the process. Through application of the 10 series she was able to change one’s structure so dramatically, that it also changed how the client perceived the world. It is from that newly emerging awareness that Dr. Rolf felt we could move towards a greater expression of our human potential. Clients would often return for the following session exclaiming that the pain in their back or knee was gone. Dr. Rolf would say not to pay attention to that, as it is only a secondary result of the work and not your primary concern (evolution). Ida P. Rolf (1896-1979) was born in New York City. She attended Barnard College, graduating in 1916. She went to work for Roc kefeller Institute in N.Y.C. By 1920, she received a Ph.D. in biochemistry at Columbia University and became an associate professor at Rockefeller. She started her inquiries into the nature of connective tissue almost by accident. She began to see people who no one else could help because she believed that with yoga, stretching, and manipulation she could correct structural difficulties. As her work grew more successful she realized the need to teach her work to other practitioners and so by the late 1950’s, she developed the “formula” or “recipe” of ten sessions. 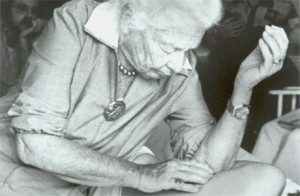 Dr. Rolf’s contributions to the field of somato-therapy include not only her use of connective tissue manipulation, but also her recognition of gravity’s effect on body structure and function. Her basic premise is that if gravity can get flowing appropriately through the body then, spontaneously, the body can heal itself. She felt that not only does structure determine function, but function also determines structure, and that any work that can favorably modify structure will improve function of the body. Her work is designed to create length through the body and to release the holding patterns so the body can return to (or in some cases, find for the first time) balance. In the late 60’s, Fritz Perls, the father of Gestalt Psychology, invited her to visit Esalen Institute, which had recently been started by Michael Murphy on the Big Sur coast, just north of San Farancisco. She was well received and started teaching classes there. From that experience, the idea of a school with formal training was born and the Rolf Institute was eventually founded in Boulder, CO. Presently, there are over 20 schools teaching the concepts and methods of Dr. Rolf’s Structural Integration work around the world. I.A.S.I. or the International Association of Structural Integrators is an umbrella organization that was created in 2006 to bring all the schools together and create a site that could easily provide the public and potential students with information about Structural Integration. If you are curious about receiving the work or would like more info on training programs, click here. A typical session is an hour or so long and is done with the client wearing underwear. A low table is used without draping. The client starts by standing in front of the practitioner so that front, sides and back can be viewed in gravity. Mental or written notes are taken on perceived patterns, rotations, client attitude, and present emotional state. The importance of being able to utilize the biopsychosocial model throughout the series is critical to achieving positive results for the client. Client is then asked to lie down on the table and the practitioner proceeds to work in the appropriate areas. Client may be asked to stand, sit or walk several times during the session. The session will end with some movement work, work on the neck and a pelvic lift to create balance. Each session has its own goals and the recipe itself is a relaxed guide on how to proceed in the unwinding process that typifies a Structural Integration bodywork session. For example, the first session deals with opening the chest, shoulders and hips, while the second session includes work on the feet, lower legs and back. The sessions continue, working from superficial layers to the deeper layers. The final three sessions are concerned with intergrating all that was learned from the previous sessions. It is important to remember that movement is the key to life. Movement on a gross level such as walking, running, and exercising is more apparent, but on a more subtle level we need to consider blood flow, peristalsis, cellular movement and the breath. This work refines our awareness of how we move through space. It clarifies proprioception for us and allows a certain grace to enter our being that helps define us as human. Proprioception is the ability to know where we are in space. Using gait as a tool for paying attention, our body learns on a deeper level, the possibilities, and the potential for more refined movement. By the end of the ten sessions, all of the movement exercises we have performed will become a choreography that makes sense to the newly freed body that you have acquired. Your body will pick and choose from the potential menu that it has been given and translate it into a smooth, fluid, efficient action. Your body will often feel lighter, more responsive or more open after each session. This new awareness of your structure and how it feels to be in this new body can cause major shifts in how you present yourself to the world and how you think and feel about your existence. Massage Continuing Education – Why it is important! -This is an interesting article. It sounds like a system of various stretching disciplines, which would be great for my semi-sedentary lifestyle…lol. I am eagerly looking forward to more information on this subject and will check back often. -This was my original website. I revamped it according to Kyle’s suggestions for keywords and such. My affiliate page is fairly bare, http://www.steppingstonestofinancialhealth.com. And steppingstonesforhealth.com is focused on low back pain. -Thanks for looking it over William. I appreciate your comment. Abbe Ciulla on Massage Continuing Education – Why it is important!